Years’ of experience installing and maintaining hydronic systems lends itself well to compiling lists: 1) what to do 2) what not to do and 3) how to fix what shouldn’t have been done. New to the webinar series, Eric Aune, contractor extraordinaire plus virtual industry spokesman, will walk and talk our audience through the pesky mistakes he commonly sees in the field and share his industry know-how in order to maximize your return on investment: a happy customer. → What is the nonnegotiable install tip list to reference in order to avoid future headaches for the next service person? 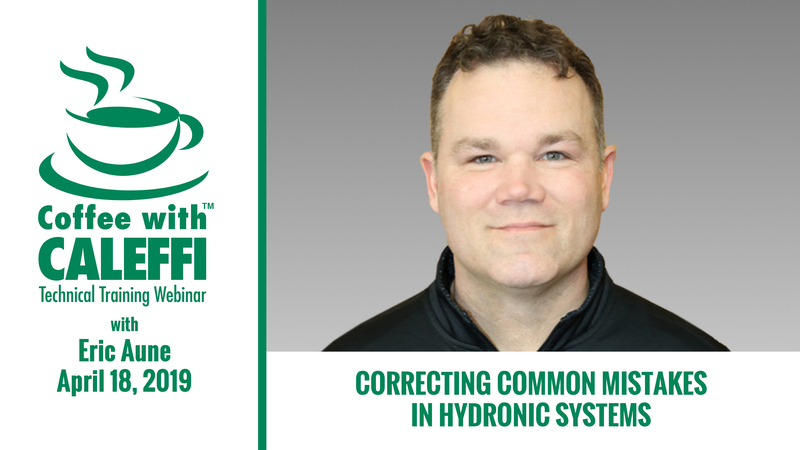 → The problematic symptom and solution list for hydronic systems. → What are the differences in maintaining a traditional boiler vs. a Mod Con? → What about seasonal maintenance: is it a must? → Contractor tool list: What are the must-have and must-know tools? → Factory training. How important is it? → Aune’s request to hydronic manufacturers. Aune, owner of Aune Plumbing and Heating (Zimmerman, Minn.) and operating partner of the popular Mechanical Hub website is driven to learn and motivated to teach. He’s an industry megaphone, sharing his expertise on digital platforms and encouraging the next-gens. Aune specializes in radiant heating, high efficiency hydronic systems and - in his own words - is a “tool nut”. Coffee with Caleffi technical training webinars are free and intended for contractors, designers and wholesalers. By submitting your webinar registration, you are consenting to email communications to keep you up-to-date on industry news. A Certificate of Attendance is emailed to attendees following the webinar for continuing education consideration. Missed a webinar? No problem, our webinar archive is available 24/7 for your convenience. If you have questions on webinar content, please direct them to bob.rohr@caleffi.com. Welcome to Place Bonaventure, Montréal. Please make note of our Easter holiday schedule. We will be closed Friday, April 19 and resume business as usual on Monday, April 22. Enjoy the holiday weekend!